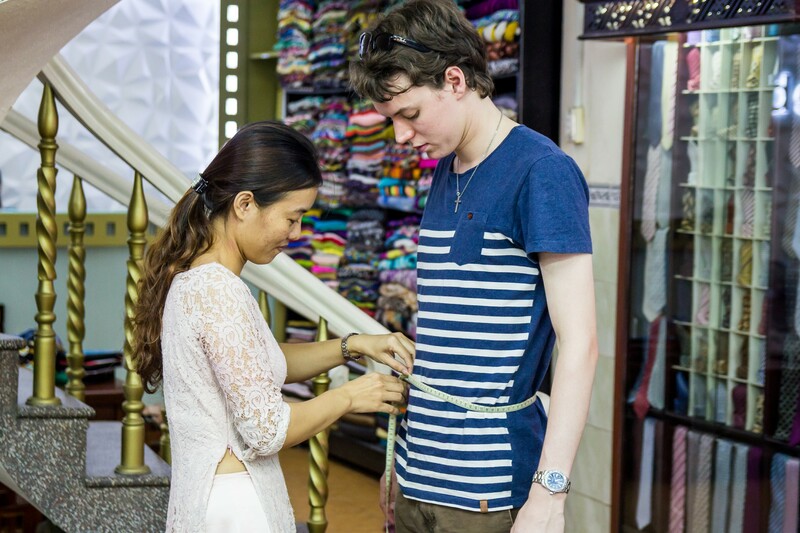 This Vietnamese destination has become somewhat of a mecca for bespoke enthusiasts, as well as an easy entryway into the world of custom-made threads. As more and more travelers stop by in Hoi An mainly for this attraction alone, competition is fierce with over 200 shops vying for attention. 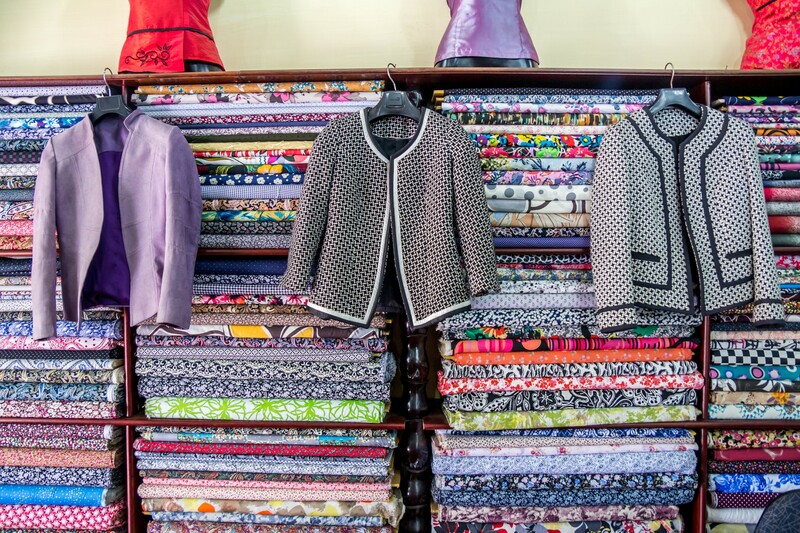 This Vietnamese destination has become somewhat of a mecca for bespoke enthusiasts, as well as an easy entryway into the world of custom-made threads. As more and more travelers stop by in Hoi An mainly for this attraction alone, competition is fierce with over 200 shops vying for attention. In a radius of four blocks, the average bypasser will be approached at least four-to-five times by store owners and/or commission seekers. In addition to the persistent propositioning, the wealth of options mapped out in labyrinth-like fashion can be extremely daunting to process for the novice buyer. 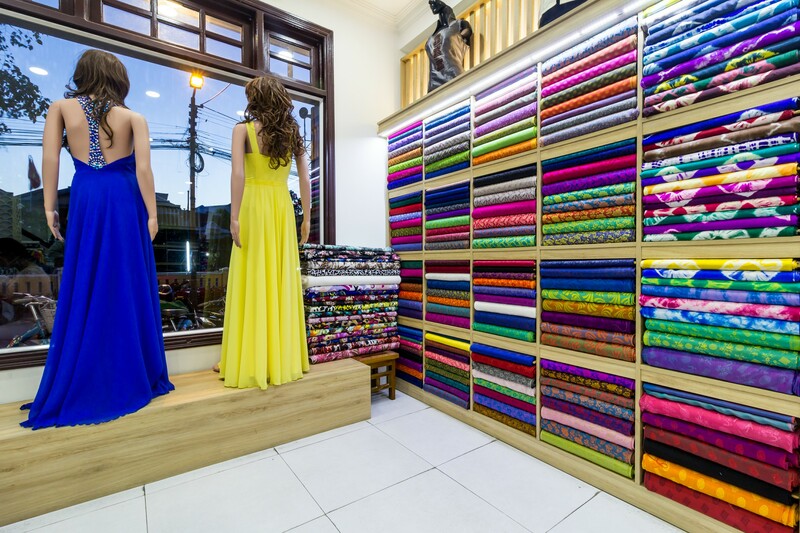 Instead of drowning in the mayhem of the tailoring experience, here are ways to stay afloat and navigate the seemingly endless sea of cloth shops in Hoi An. Just because the word “tailor” is advertised in the shop name doesn’t mean it’s the real deal. Many shops in Hoi An do not do the work on-site. Instead, the sewing is outsourced to mass garment factories (a euphemism for sweatshops) or independent seamstresses. Not only do ethics come into question, but your custom-made clothing becomes just another mass produced item, created with no care or concern for quality and detail. These kinds of dealings continue to be problematic because for tailors with no experience in the craft, chances are measurements will not be taken properly and quality fabric will not be offered. With language barriers impeding communication, chances are frustration will lead to poor or hasty decisions. What may feel like a bargain initially will ultimately be a poor investment. One thing to remember in Vietnam is that you get what you pay for. Something to keep in mind when comparing prices between shops is the value of your purchase in comparison to what you’d be getting at home. 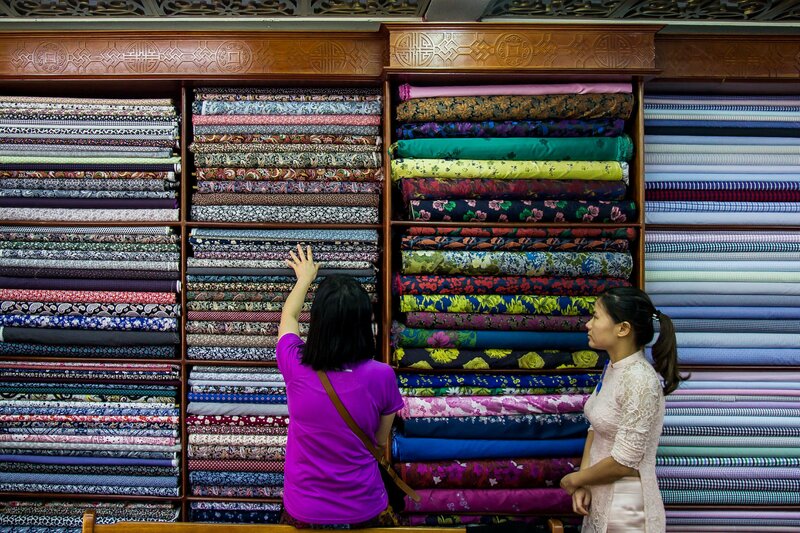 Everything is a steal in Vietnam; what matter’s most is getting the best value without compromising quality. Not only do ethics come into question, but your custom-made clothing becomes just another mass produced item, created with no care or concern for quality and detail. In the construction of a suit, especially the suit jacket, the build is as important as the quality of fabric and fit. 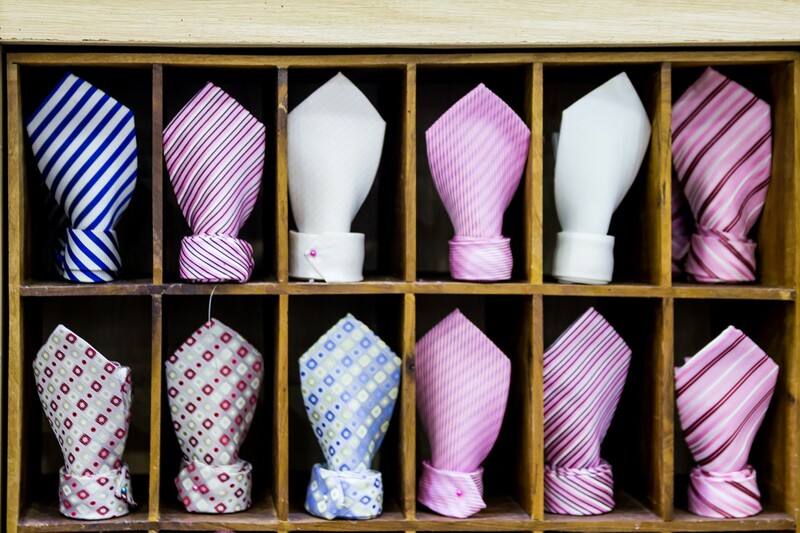 In the world of bespoke tailoring, there are three options: full canvas, half canvas, and fused. The best type of tailoring is full canvas. While boasting a higher price tag, a full canvas treatment provides the wearer’s suit’s visible structure and molds to the wearer’s body over the time. How this is done is a canvas is sewn between the lining and the outside layer of the jacket. Full canvas is a must for those looking to invest in longevity. Be wary of fused suits. Mostly a timesaver, fused suits look great at first but deteriorate rapidly over time. A synthetic interlining is heat pressed (glue) into the wool of the suit. One issue of fused suits is that the glue loses its tack over time, causing a collapse in structure, or if overheated, can cause bubbling in the chest area from loosening tufts of wool. While the perk is cost efficiency, what is jeopardized is the quality. The half canvassed suit is the middle ground between the two extremes. Basically, you have a fully canvassed approach to the chest and lapel regions of a jacket, while the side panels and bottom part of the jacket are fused. While it won’t be contouring to your shape like a full-canvas, suit, a half canvassed jacket is much lighter and breathable while the structure in the front, the territory where it matters most, stays rigid. First time tailoring a suit? Here are some things that will be asked of you when designing your custom piece. First and foremost, what type of fabric and fabric blends are you looking for? Next, color and pattern will come into play. Keep in mind, suits come with both an outside layer component and inside swatching. Don’t forget to ask for blanket-stitching, which means that all your items are double stitched and won’t unravel upon first wash. In terms of service, when asking for a quote, make sure that all taxes and fees are included. Contest additional fittings if itemized on your bill, as those normally come free of charge. If you need to send clothes home, most tailors will ship to the United States for an extra charge. It isn’t unusual to be quoted in USD and in actuality, cash is the best route considering some cards are charged an extra fee. If a deposit is requested, this is not an unusual practice. Almost all shops ask for a retainer in all fairness, but it should only be a fraction of the cost, and not the total cost. 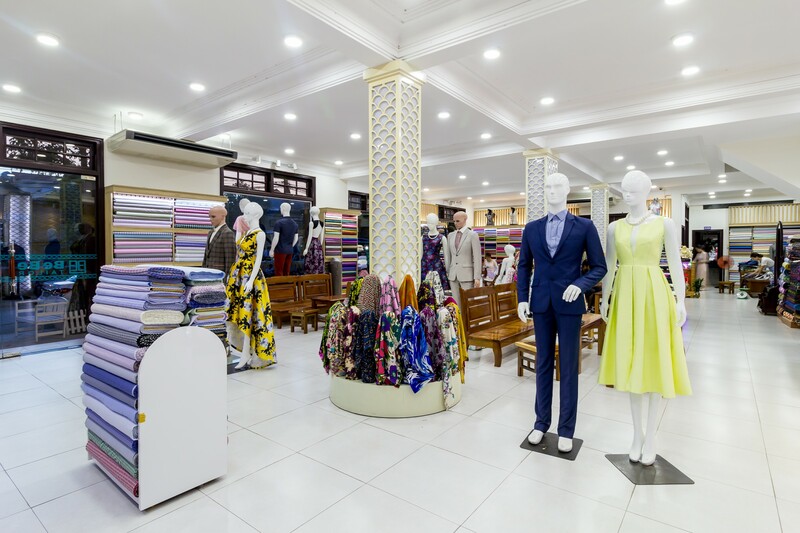 For a three-piece suit with a vest component, dress pants, and tailored jacket, made with upscale fabric, my boyfriend was quoted 6,000,000 VND (about $265 USD). That being said, three-piece suit packages should be between $150 and $300 depending on the quality of fabric. 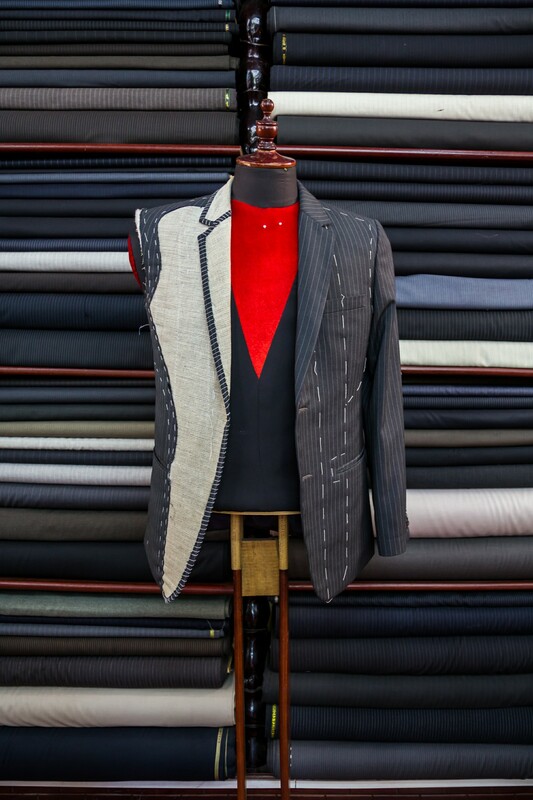 In the relentless search for the best tailor, one business stood apart from the rest. BeBe Tailors, a family business operating for the last nine years, has amassed a loyal fanbase on the internet. What started off as a tiny mom and pop shop has evolved into a three-store enterprise, with a flagship location on 11 Hoang Dieu Street (Bebe 1) and two smaller establishments on 95 Phan Chau Trinh Street (Bebe 32) and 40 Tran Hung Dao Street (Bebe 3). With over 25 years of tailoring experience, the owner, Mrs. Bi, one of fourteen children, opened Be Be with a tow of relatives manning the operations. From humble beginnings on Tran Hung Dao Street, a reputation for quality clothing quickly led to the expansion of the Be Be empire. Today, the Hoang Dieu store showcases recent expansion projects including the beloved on-site factory. At the back end of the house is Be Be’s workshop, partitioned only by a glass window. Guy himself fought for the installation of the window in an effort to build more transparency between the customer and the business. 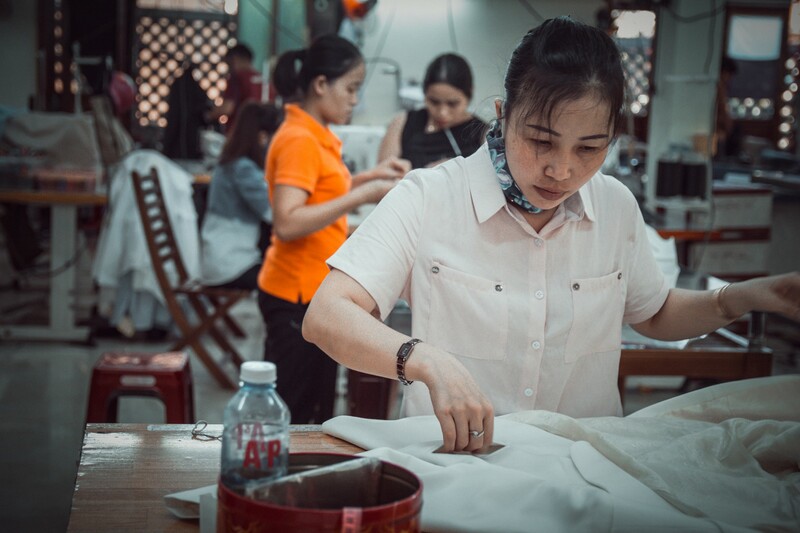 In an era where responsible travel is becoming more of a staple on itineraries, guests can have a look at what goes on “behind closed doors” if you will, ensuring their garments are not being produced by sweatshops and unhappy laborers. If you want a tour of the factory, you need only ask. 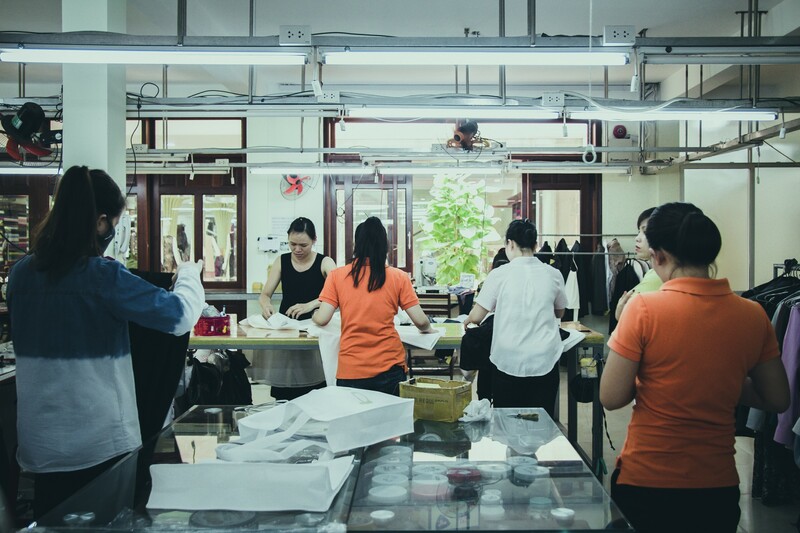 In addition to their sweatshop-free work atmosphere, a portion of the proceeds is donated to the community as part of the “Be Be in the Community” initiative. Currently, Be Be is backing The Kianh Foundation, Sapa Kids, and helps to sponsor men’s and women’s football leagues in Hoi An., With a management governed by “East meets West” principles, coupled with great ethical practices and an identity rooted in family, it comes as no surprise as to why Be Be is our choice for the finest tailors in town. Hello Guy! Thank you for having us today! One of the biggest tenets of your brand is being a family business. How does that help your culture of operations being a family business? We have lots of staff. (laughs) The owner, my auntie, is one of fourteen kids. At the moment, we have about 160 staff members here between the three shops. 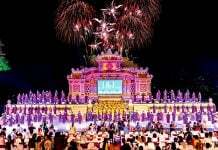 Out of the 160, at least 50% of staff are relatives. My wedding, because of the amount of family, had over 800 guests. I’ve been here about 15 years now and I got married into the family about 9 years ago, which is how I ended up here. We discovered that you were the first customer of the shop! True or false? When I first entered the picture at the time, it was just a really tiny shop. The first customer of the day, as is customary here, is massively important. So if you take that logical step back, the first customer ever of a business is INSANELY important so my auntie asked me if I would do her the honor. She knew that I would pay full price and there would be no bartering so it would be a perfect first customer scenario. So I ended up as the first customer. And since the business has grown into the multi-million dollar business it is at the moment, these successes are heaped on me just because I was the first customer. Forget all the hard work everyone does, they exclaim, “no no, its just because [I] was a lucky guy coming in.” So it’s funny looking back at the order book now with the 70,000 customers we’ve had already and there’s my name listed as receipt number one. It always makes me laugh. Lovely! 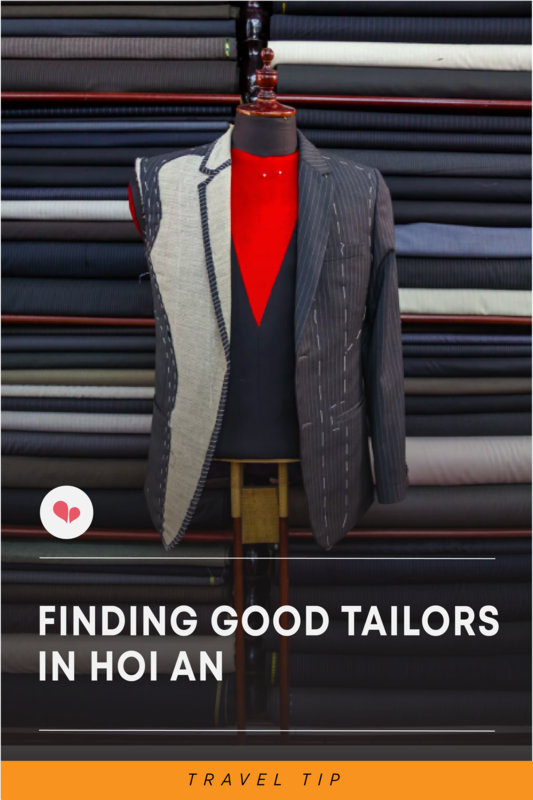 So, what makes you stand apart from the masses of tailor shops in Hoi An? Where we differ is definitely on the subject of quality. Eight, nine years ago, before this shop existed, customers would come to Hoi An to buy a suit and you could give them whatever. They would walk out the shop and you would never see them again. This was before Twitter, Facebook, Tripadvisor. We never saw it that way, always opting to walk down the quality route. Looking at that choice right now has determined our success today, why we’ve gotten so big so quickly. We have a team of 15 making up our quality control division. It first goes to tailor-specific quality control members and then is filtered on over to a dedicated team of quality control. Now there is one staff member specifically assigned to every customer. They are the ones in charge overall of quality control. So technically, it goes through three quality control systems before it gets out. We also then decided that this “internet thing” was catching on a little bit so we decided to invest a lot in the last couple of years in how we’re perceived on the places we’ve been noticed. Tripadvisor is a big thing. You have 200 tailors in town, all saying the same thing. But we stand out by answering our Tripadvisor reviews in a friendly fashion. When someone looks at these reviews, they always go to the 5-star reviews, then straight to the 1-star review to see how issues are being dealt with. We’re very conscious about that. We’re not even deterred by those negative reviews so long as we do something immediately about it, i.e. getting in touch with the customer, change whatever needs to be changed, give them a refund, etc. Whatever it is, as long as we’ve taken the time to apologize and address the needs, that is the most important thing. We are even being approached by outside mediums. Channel 7 Australia was here a month ago filming a segment called “Luxury Escapes.” It feels really big, in fact, a little scary big because it has such a massive reach. We’ve also been featured in a German travel magazine, Merian, which is coming out next month as part of a special on Vietnam. What we’re trying to do is spread the word before people even come here. It’s all about getting that guarantee from the customer before they leave that they’re 100% happy. That’s the only way we can do it. We like to be proactive. 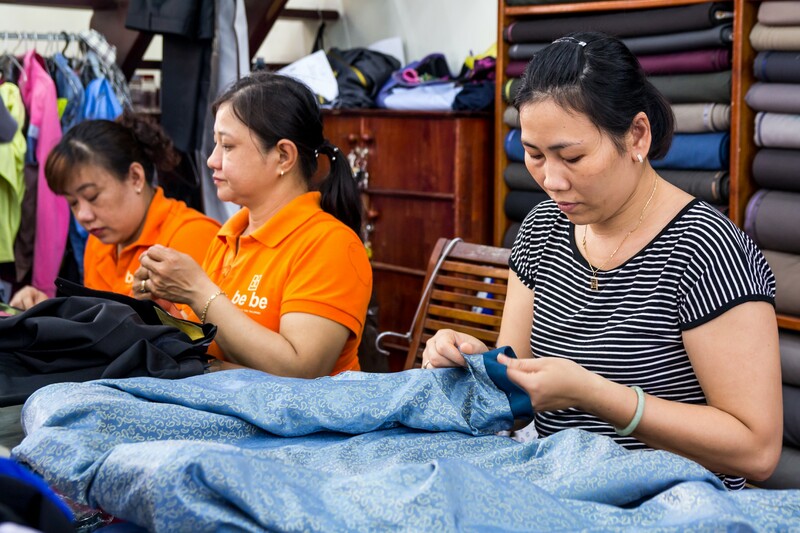 We are one of a few, if not the only place in Hoi An, that once you go into that fitting room and start changing, our staff will unabashedly point out what is wrong. They basically make work for themselves. We will keep changing, keep altering until we get our equivalent of a visible sign-off of “yes, I am 100% happy” from our customers. Hearing “that’s okay” is just not good enough. We like to be proactive. Can you give us an overview of the tailoring process at Bebe? When you come into the shop, the staff will sit you down and proceed to show you ideas via an Ipad. If you’ve got ideas already, all the better. It just makes things nice and easy. A picture painting a thousand words couldn’t be more apt for this scenario. The design process normally takes about 30 minutes to an hour where we’ll sit down with the customer. If it’s a business suit for example, we will discuss about 12-15 options. It’s normally a 12 to 24-hour turnaround where we make the garment and then invite people back for the first fitting. We make the suits intentionally large for the first fitting so that the suits are guaranteed to slip over your shoulders and we then alter them to create a custom-built fit. Second fittings are normally just the small touch-ups, and sometimes it goes into a third fitting at which point, we will get the okay-go from the customer. We will then deliver the finished product to the hotel. You deliver to the hotel? Oh absolutely! I promise you, if the customer needs something or wants something… if they want an umbrella or a beer, there’s nothing we won’t do. Talk about customer service! Do you have a signature tailoring style or technique? We showcase original designs at the front the shop so that we stand out from the crowd. But last year, we brought on an on-site designer. She started creating these very fantastic designs so now, we’re really trying to focus on her artistry. The aesthetic is definitely Asian fusion with a bit of Hoi An, which is great since that’s where we are. Thank you so much for having us! 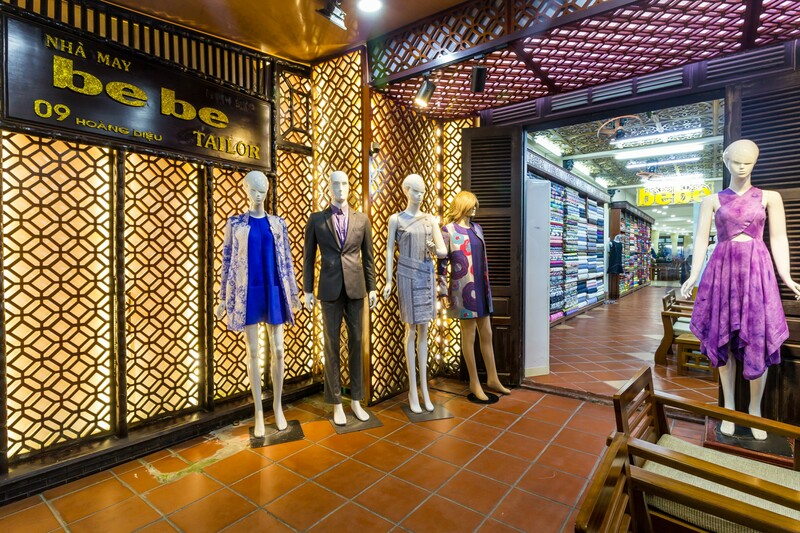 For a 10% discount on Be Be tailoring, please ask the reception at Christina’s Hoi An. 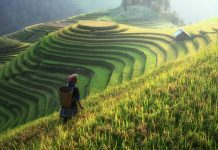 Enjoyed reading this and want more fun, informative articles on what to do, see, and eat in Vietnam? Follow us at the Christina’s blog! Would you like to do more shopping, we have a full guide here detailing where you should go and what to get while in Hoi An. Maybe you only have one day in Hoi An, need some ideas? And finally, at times traveling can get to be a lot between visiting new places every day, eating new food, and fighting for a place to take photos of monuments. 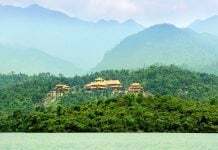 Do you want to get off the beaten track in Hoi An? It’s worth the extra adventure.